A new partnership between the International Living Future Institute and Toxnot will help manufacturers provide better-quality health information. Only a few Declare labels are third-party verified, but under a new partnership with Toxnot, that will change. The International Living Future Institute’s (ILFI) Declare label is supposed to be an easy-to-read “nutrition” label for products, showing the product’s ingredients and whether or not it contains any of ILFI’s banned Red List chemicals. This simple document belies the underlying complexity required for manufacturers to track chemicals used to make their products. This complexity also makes it hard for manufacturers to be sure their Declare labels match the reality of products. Enter the Toxnot partnership. Toxnot is a software tool and chemical database that provides a standardized method for gathering material data, allowing manufacturers to track the chemical constituents in their products throughout their supply chains. Announced at the 2018 Living Product Expo, the ILFI/Toxnot partnership pairs manufacturers seeking a Declare Label with software that can show chemicals of concern down to 100 parts per million. It can then be used to help generate a Declare label. The tool can track a product’s progress towards meeting Declare as different materials are used, so if a product does not meet ILFI’s criteria, the software can show lists of more sustainable chemistries. 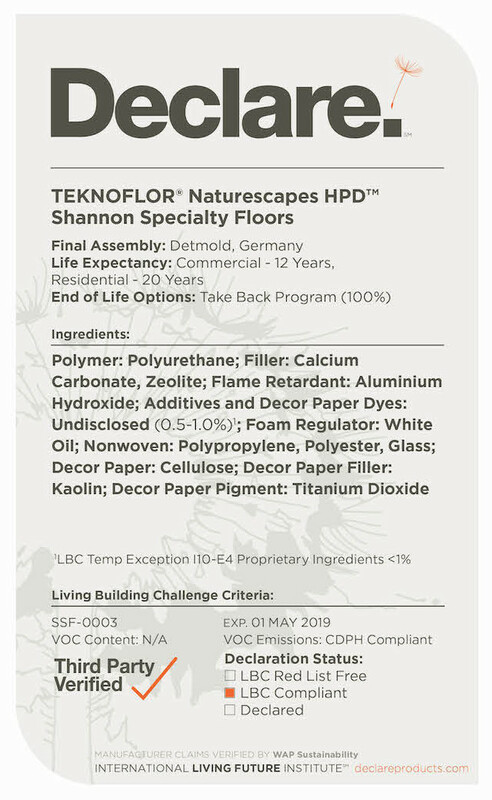 Once the material ingredients meet the desired level of optimization (options are Red List Free, Living Building Challenge Compliant, and Declared), a request for a Declare Label is a “single click away,” according to Toxnot. The data then goes to a third-party verifier—a new step—then to ILFI for review, and back to the manufacturer for approval. For manufacturers with large product portfolios that use similar materials, the database will allow for quick production of Declare labels with potentially lower costs and faster turnaround for assessors. This process should accelerate creation of third-party-verified transparency documentation. Currently, out of 800 Declare Labels, only 10­ to 15 are third-party verified. Having this verification will go a long way toward improving transparency data and improving the sustainability of our material supply chain.